Neil Ducoff’s Monday Morning Wake-Up! columns have been providing a weekly shot-in-the-arm for salon movers and shakers since 2008. His new book, titled Wake Up!, is a collection of the most powerful and inspiring Monday Morning Wake-Up. Neil Ducoff’s Monday Morning Wake-Up! columns have been providing a weekly shot-in-the-arm for salon movers and shakers since 2008. 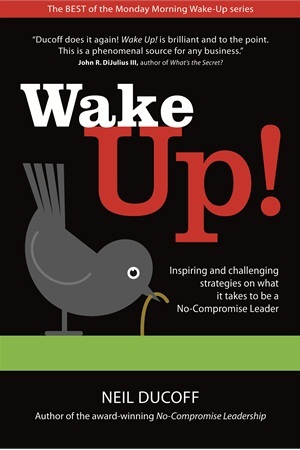 His new book, titled Wake Up!, is a collection of the most powerful and inspiring Monday Morning Wake-Ups designed to motivate, challenge, captivate, and spur leaders of all levels to greater success and ease of operations. Each chapter offers practical advice to work through leadership challenges and turn goals into measurable gains. For the uninitiated, Monday Morning Wake-Ups are full of fast, relevant strategies to survive and thrive in today’s “new normal.” These quick doses of no-compromise thinking have been changing the way leaders run their businesses. Each column offers concrete ways to develop and grow your business into one that is envied by competitors. For more information, go to www.strategies.com.